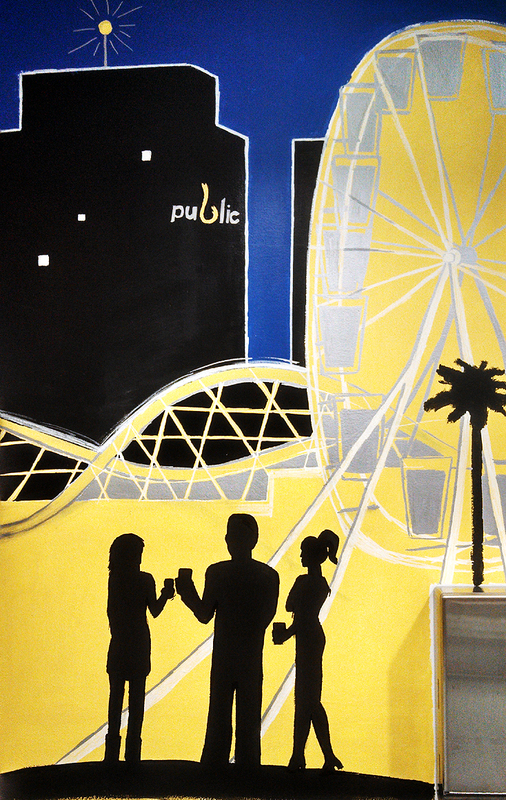 This blog post is to sort out the process I went through in creating my first large-scale mural last month at Public Beer Wine Shop in Long Beach, CA. 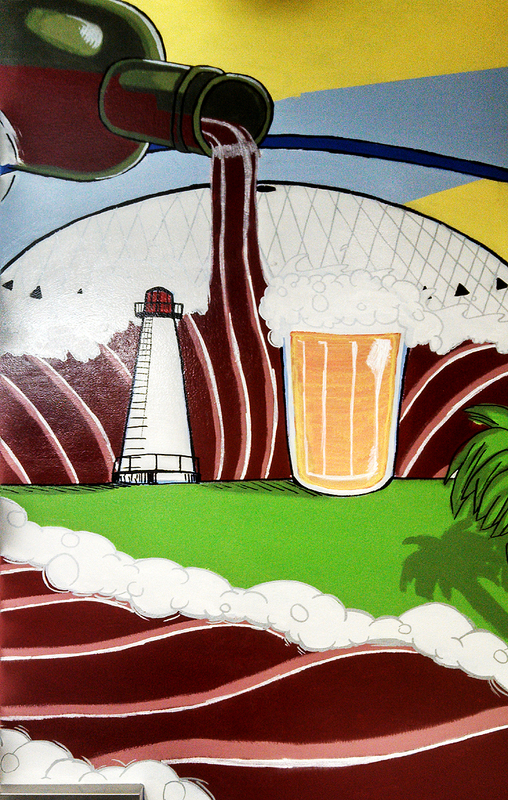 I was commissioned to create a 9 x 5 x 4 ft. piece of art that incorporated iconic Long Beach images – and drinking, to keep with the theme of the location! I had never created a painting this size by myself before, and I had the added challenge of a close deadline. 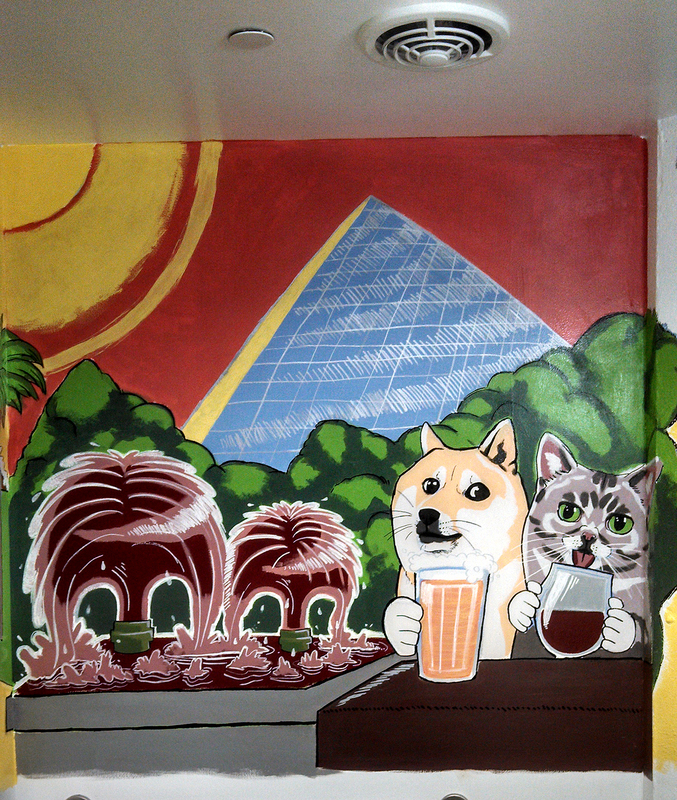 In five days, most of 3/4 of a room was covered in my trippy outsider’s homage to the LBC. 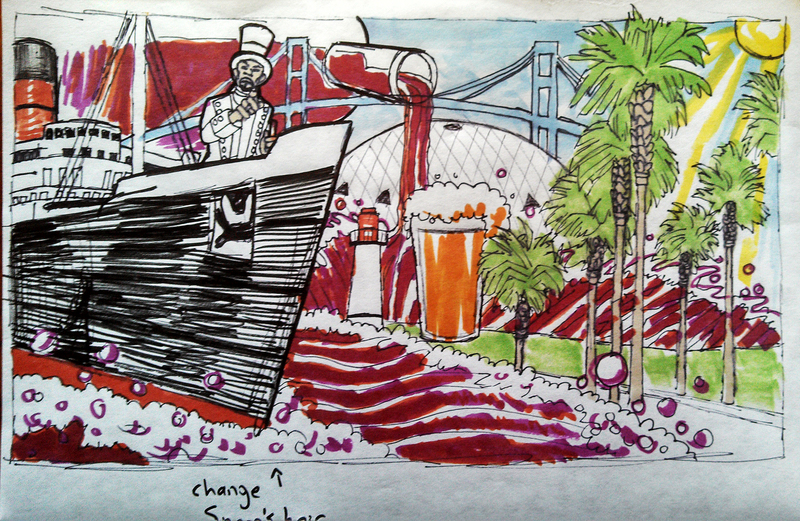 These sketches were approved before moving forward with painting the room at Public. 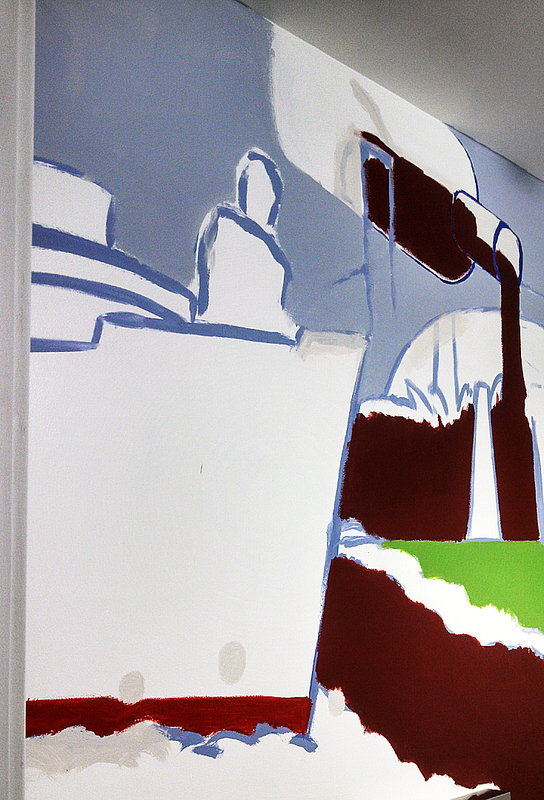 On a Monday, I began working by laying out the general shapes and line art on the walls. This stage has always been essential for me whether I’m painting with oils or acrylics, in Photoshop with a tablet, or drawing in my sketchbook. Getting the layout correct paves the way for the entire work. It is absolutely necessary to get a grasp on proportions, layout of all elements (figural, architectural and otherwise) and hierarchy of these elements during this stage if you plan on following those structural boundaries as you work. 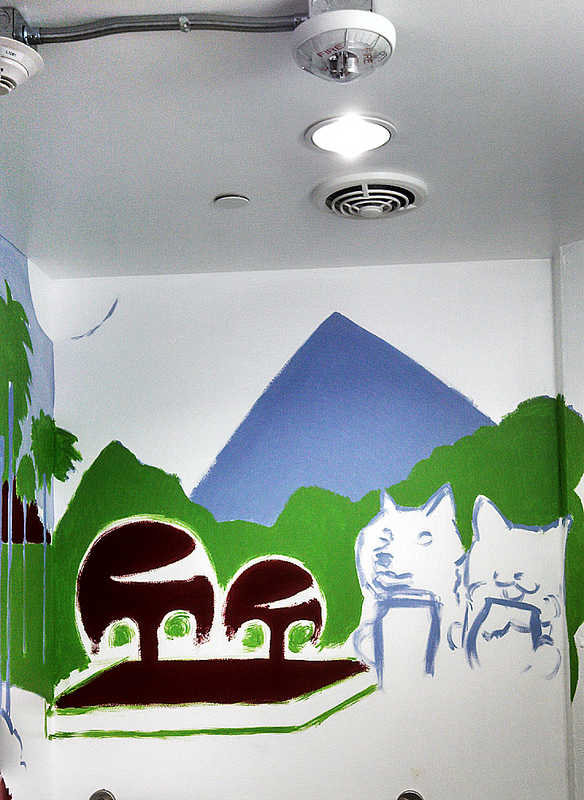 So, with light blue paint, I transferred my design very loosely onto the walls, and then moved on to filling in large blocks of color. I used Behr brand interior matte paint in primary colors, mixing the colors I needed in a bowl as I went. A quart each of black, white, red, blue and yellow paint was more than enough to cover all of the mural. I tried to move back and forth across the design, filling in bits here and there instead of focusing on one wall or section at a time. 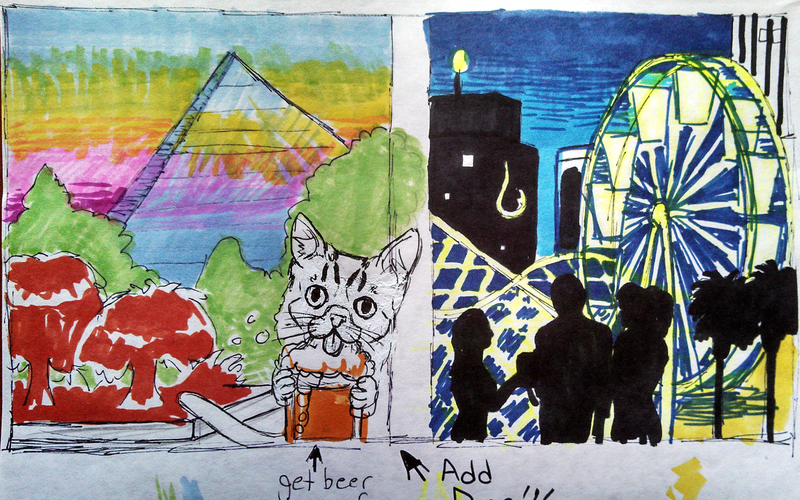 I think slowly building up the ‘big picture’, especially for something like a mural, preserves consistency of style. 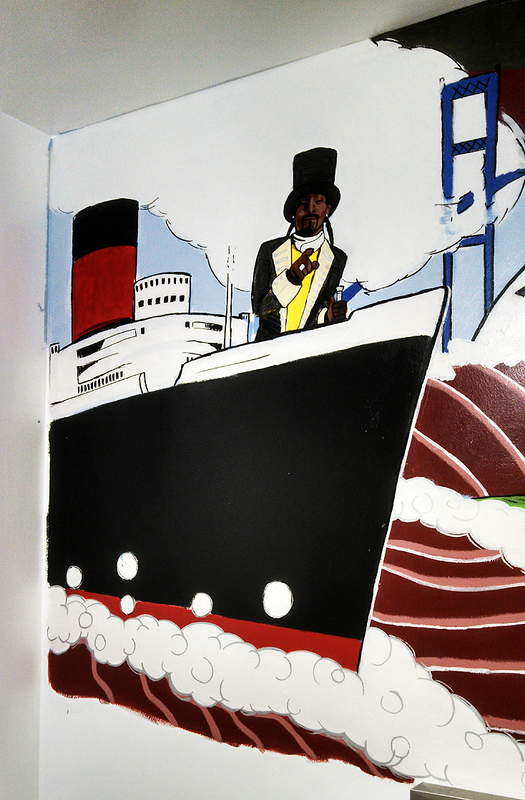 A lot of the detail work was filled in with acrylic paints and paint markers. By Friday afternoon, I was almost finished. 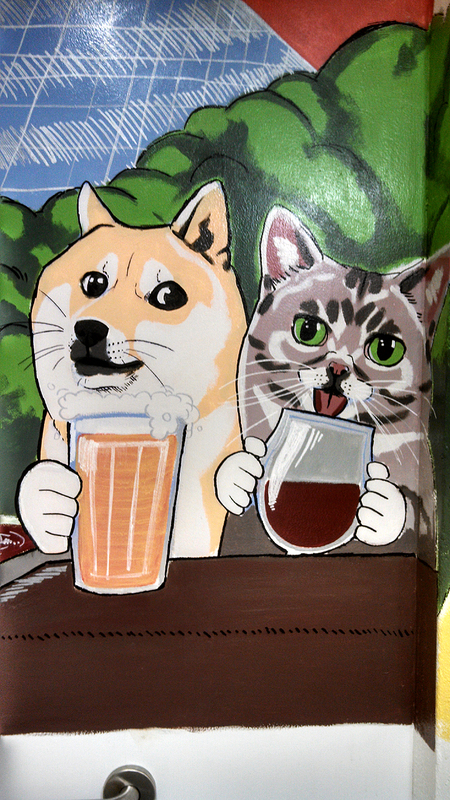 Many requests were made for cute animals, which translated to Doge and Lil Bub enjoying some alcoholic beverages. 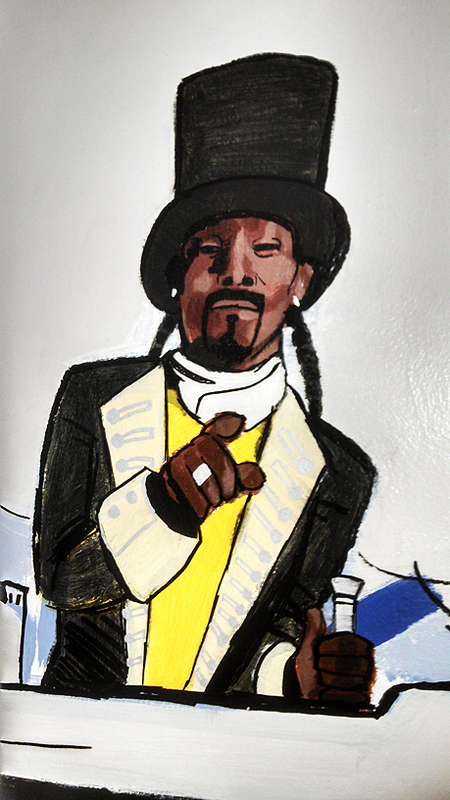 They don’t have much to do with the LBC but I will use almost anything as an excuse to draw celebrity pets!